The entire film is available now on DVD in Diesel's and Island Bar or directly from the filmmaker - albarayton@hotmail.com - for $70 for Lammaites, $80 for tourist (profits to LAWC). It has a number of Special Features, including a Sok Kwu Wan feature, a slide show and some of my helicopter shots as an animated slide show with music. ("Maybe Lamma isn't such a paradise after all..."
Excellent@ What about the international friends of Lamma? Maybe upload it at the paid streaming service http://distrify.com/ – i recently watched "Urbanized" there and it works fine. Thanks, regards. 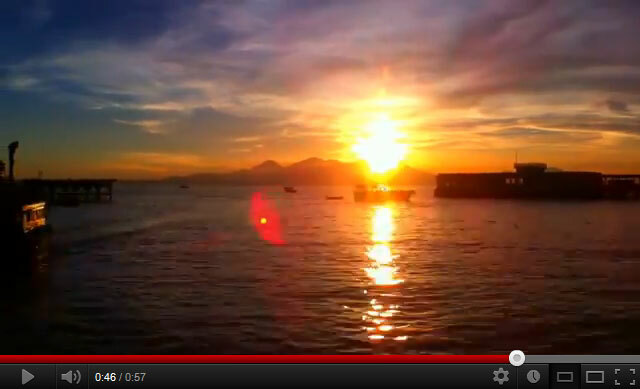 I made a short film this summer in May,2011 on Lamma. It is the final year project from my school , a narrative story. Can I post it here ? I made this the current Lamma Video of the Day on the home page. or is the trailer just for a school project, without a full movie? Dragon Dance and Firecrackers, outside YSW's main Tin Hau Temple, Sun, Jan 22, 2012, Lunar New Year's Eve. Submitted by Lamma Newbie Johan Nylander. Thank you! 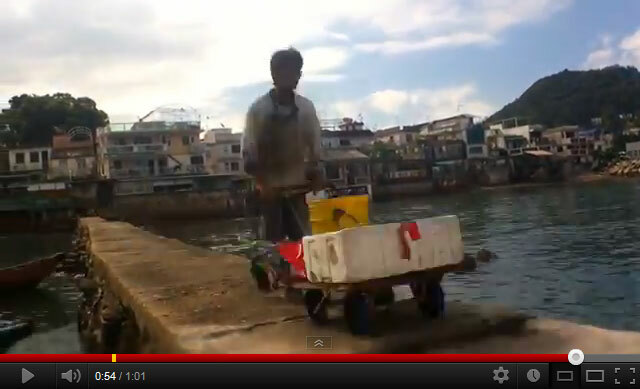 I took the following short vid during Nesat's brief visit to Yung Shue Wan. Just uploaded, only 69 views so far. Let's see how many more views we can add! Some of you might recognize 2 daughters of Brad the Bradass and two more talented young Lamma Ladies in there. Despite several weeks of me trying, egged on by their superproud dad, these superbusy ladies haven't found time yet for a proper Lamma-zine interview about the "Making of" this pretty, uplifting, well-filmed and -edited music video, a Lamma Video of the Month. Two new Lamma Videos of the Day from Donna Foreman, the semi-official, yearly videographer of the Lamma 500. Very well-filmed, -edited and with catchy music, looking like really professionally produced music videos! "Taking the HKKF from Lamma to Central, Hong Kong, December 2009. It could have been docking a space station in orbit. Just a handheld Canon 7D camera, performing quite well in low light. This is a everyday-view for many people, still amazing. More film and music at http://www.stratoponjak.com." The Lamma Zombies picking up their 2nd and 3rd place dragonboating trophies on the stage in the Discovery Plaza on Sat, June 23 (Tuen Ng, Dragonboat Festival Holiday). Loads more photos and stories in the Lamma-zine, June 26-28, 2012. Last edited by Lamma-Gung on Tue Jul 17, 2012 6:20 pm, edited 1 time in total. "A whale shark in Hong Kong waters, spotted July 1st 2012 at 12.50pm, Turtle beach, South of Lamma island, while kids were playing in the water and we were windsurfing. The whale shark can be recognized by the regular dots on his skin. Look closer at this movie to better see them. He is not a meat eater - a peaceful shark. Our waters are safe ! Thank you to the Marine Police for coming quick." TVB Jade documentary, first broadcast on Fri, July 27, 2012, 7pm, in Chinese only, but very interesting even without words. File comment: Saheb & Oreo, interviewed in 7th Avenue. These are awesome and very informative videos. I like that type of videos. thanks to post this awesome videos. I would share these lama videos with my friends and family. I am very thankful to all users. Thanks for your link spam posting, promoting a German carnival costume website. Yes, we have quite a number of Oktoberfests in HK now, even on Lamma according to the Oktoberfest beer mugs and aprons I spotted in the "Beer Garden" last week while volunteering with the glass recycling collection. But we usually don't need any German carnival costumes when joining any Oktoberfests, so your link spam is not well-targeted at our mostly Lamma- and HK-based members, unlikely to generate any click-throughs or even online online orders. As this posting is quite friendly and harmless, I let it stand for once, even though I usually kill any spam message on sight and delete the spammers account immediately. As all new member registrations of this forum need to be hand-approved by myself, taking a few hours after registration, this one slipped through. I've managed to keep this forum spam-free for all these 10 years. It's a minor but daily task as I need to view all messages to make sure they're not spam and occasionally reminding forum members of the few very basic rules of this forum (see Sticky messages at top of some forum topics). Dear link spammer from the US, please try to get the spelling of "Lama" right next time and try to use a different avatar occasionally as your "Twist It" picture is common to many link spammers. A standard promotional tourist video, for Lamma visitors, not for residents.